Below are excerpts from the school’s website. You can discover more via the following links. Brightworks is a school that reimagines education. By taking the best practices from both early childhood education and hands-on, project-based experiential learning, we strive to meet students’ needs in a flexible, mixed-age environment that breaks the traditional walls between school and the community outside the classroom. 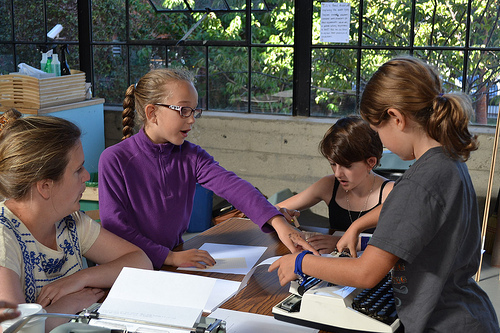 We offer a broad-spectrum learning environment designed to encourage creative capacity, tenacity, and citizenship. Using the Brightworks arc as a framework for deeply engaged learning, children develop the ability to find wonder and delight in the exploration of any topic, to practice working together to turn ideas into reality, and to learn how to communicate what they have done and why – all in the context of a diverse community of collaborators, families, volunteers, and supporters. See the kids in action on our blog. At Brightworks, students explore ideas and pursue their interests through a structure we call an arc. Each arc takes as its premise a central theme, to be explored from multiple perspectives. Students interact with this theme in three different phases: exploration, expression, and exposition. Let’s take the idea of wind as an example of a Brightworks theme. Imagine it as a topography: a map with different concepts within the idea represented as regions on the map. Wind power, meteorology, flight, nautical history, and art are all different perspectives through which to understand the idea of wind. We populate this landscape with experts, people who have gained a deeper understanding of wind through their work, art, or passion. We place tools and materials within this landscape that offer a path towards deeper interaction with the theme. Our students fly kites, experiment with wind tunnels, and build turbines. We curate experiences that allow our students to play with wind, to feel its power first hand, to be inspired by its physics and aesthetics, and to grasp its relationship to the world around us. Through this exploration, our students gravitate towards an aspect of wind that intrigues them, often clustering around a common interest. We help these groups turn their curiosity into a declaration: a proposal for a project that expresses their new-found inspiration. Students present their declaration to the Brightworks community, and request the tools, materials, and support they need to complete their project within the timeframe of the arc. 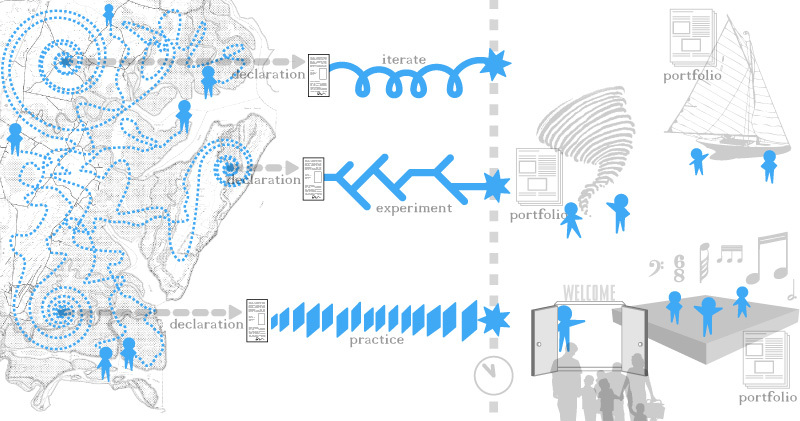 The project can be any meaningful undertaking that results in a deeper understanding of the theme. Students might build boats and sail them, create a work of art that visualizes tornadoes, or write and perform an opera based on Amelia Earhart’s final flight. For some, the expression phase will focus on the development of a skill by way of guided practice with an expert. Working together, our students become adept at collaboration, inspiring each other’s creativity, and developing the tenacity to overcome obstacles. By the deadline, students will bring their project to a fullness of expression as outlined in their declaration. Success is in the doing, and failures are celebrated and learned from. Once the deadline has been reached, students present their work in a public exposition. They demonstrate skill, express understanding, and explain the workings of their creations, receiving feedback and critique from their audience. Students document their work from inception to completion in a richly detailed portfolio that acts as both resume and transcript. This phase of the arc allows for our students to integrate their new knowledge into their understanding of the world. While reflecting on their findings, students relax and play in the glow of their accomplishment. At the conclusion of the exposition phase, we take a deep breath and embark on the next arc. An entire arc, from exploration to exposition, can take anywhere from a few weeks to two months. A year at Brightworks consists of several arcs in succession, interspersed with field trips, expeditions into nature, spontaneous endeavors, and play. Where does the name “Brightworks” come from? “Brightwork” refers to wood or metal on a boat that has been varnished or polished, or “finished bright,” rather than coated with paint as protection from the elements. When you decide to finish something bright on the exterior of a boat, you make a commitment to a lifetime of attention and care far beyond what a painted surface requires. 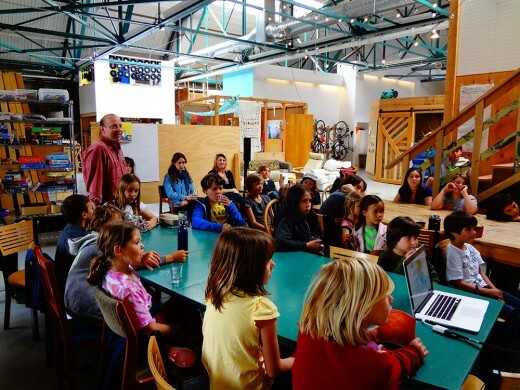 Brightworks is based on ideas that were developed and tested in two pioneering summer programs started by Brightworks Co-Director Gever Tulley and Bryan Welch, who was involved in founding the school. 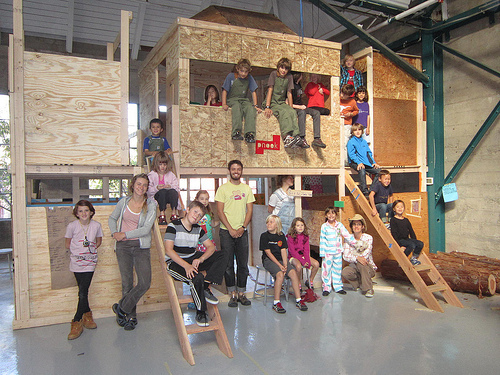 Gever created Tinkering School in 2006 to explore the idea that children can build anything, and through building can learn anything. Bryan co-created A Curious Summer to develop the idea of rich, curated explorations that would inspire children. The response – both from the children that experience these programs and from the global community of educators who follow the programs – has been nothing short of amazing. Gever and Bryan felt inspired by each other’s programs, and together they developed the pedagogical approach that is at the heart of Brightworks. The school opened its doors to students on September 6, 2011. Is this a “real” school? Brightworks is a nonprofit, private school, enrolling kindergarten through eighth grade students for the 2012–2013 school year. Brightworks follows the registration requirements provided for private schools in the California Department of Education. Our school’s future high school students will graduate with a portfolio-based diploma, issued to graduating students by Brightworks. How many students are at Brightworks this year? 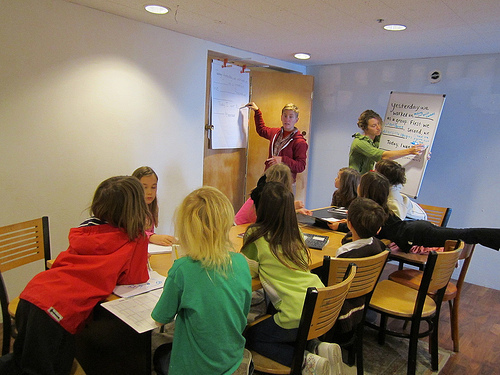 For the 2012–13 year, our student body is made up of thirty students ages five to fourteen (grades K-8). Each year, we will bring on a small group of new students and eventually have a full student body of eighty. Do younger and older students work together? Yes. We find that segregating children by age can pathologize normal, developmental differences and deprive children of the opportunity to bond with, teach, and learn from each other. Our low student-teacher ratio (8:1) allows parallel learning across our age groups, even within the same physical space. Our most developmentally-mature students are able to tackle projects that challenge and engage them, while the younger children work in a more play-based manner. Brightworks is located at 1960 Bryant Street in the Mission district of San Francisco. We embrace this simple rule at all levels and interpret the notion of “hurt” to include both willful and accidental injury. We deliberately exclude both physical and non-physical violence from the experience at Brightworks and expect every child, parent, and staff member to uphold this ideal. Here is a short article about Brightworks. Below is a video in which Gever talks about the path that led to creating Brightworks.